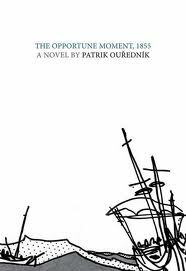 Another novel that I particularly enjoyed last year by a writer I’d never read before was Patrik Ourednik’s Europeana (subtitled ‘a brief history of the twentieth century’). Luckily two more of his books are available from Dalkey Archive Press, including The Opportune Moment, 1855. Ourednik’s interest in history continues to be evident from the title, but here the camera focuses in on one relatively unimportant event rather than attempting to give us the panoramic sweep of Europeana. The event in question is an attempt to set up an anarchist community in Brazil in the mid-nineteenth century. Here the author blames reality rather than his own philosophy. He complains that many of those on the voyage “had not even read my articles.” Not only does the experiment’s failure give us a lens through which to view the diary which follows, the move backwards in time makes a mockery of the idea of progress. There is heated debate about whether the ship’s Negroes should be allowed to join the settlement (without ever considering whether they want to), and what sanctions should be used against those who do not turn up for assemblies. Ourednik satirises without ever resorting to caricature: we sense he sympathises with their attempt to be free while at the same time recognising those attitudes which still trap them. These entries tell of the deterioration of life in the settlement after the arrival in Brazil. Their repetitive nature emphasises the way in which the impetus behind the settlement slows until it dies. Each entry is shorter than the last showing the dissipating energy of both the writer and the community. Unsurprisingly, it all ends with a drunk waving an axe. As with Europeana, this is not a novel which looks cheerily on mankind, but it does possess the same wit and elegance in its pessimism. You are currently browsing the archives for the Patrik Ourednik category.